Easter Sunday was special for a lot of reasons. In addition to the annual celebration of Jesus’ Resurrection – the most joyous event that ever was and ever will be – it was Gideon’s first Sunday to be able to sit through a large chunk of the worship service. Most Sundays are spent in the lobby, in the church nursery, or at children’s Bible Hour. I was most inclined to take Gideon to Bible Hour so he could be enriched by seeing the children he’ll grow up around, singing and having fun while learning about God. Gideon loves watching them and hearing them sing. But Easter Sunday, I was determined to spend as much time in the pew as possible. The secret to my success? Snacks. Gideon’s older cousin also sat next to him and fed him banana chips from the snack cup, which helped. Gideon adores his cousins. So, I let my boy stuff his face and he was able to last until the sermon began. Once my one year old had enough of sitting in one place (I realize that asking a little boy to sit still and quiet for an hour is too much to ask), I took him down to the church nursery, and left him with the childcare staff which I hadn’t done before. He did just fine, and was perfectly content and happy to see me when I came to get him after service. Following church service, we went to my Daniel’s brother’s house for Easter Brunch. The weather was absolutely perfect. That Saturday we’d had a huge family reunion, and the out-of-towners who were still in town came to eat with us. It was a great time. I’d also stuffed 24 easter eggs with yummy treats (berries and raisins), which I kept in the fridge until it was time to hide them in the yard. The kids had such a great time hunting for eggs, and then enjoyed some sweet treats. Hunting for eggs is hard work! Gideon also received his first Easter basket. At our home, I think we’re going to go with the tradition of “summer fun” themed baskets. This year that included a book, a swim diaper (which I ended up returning and ordered a cuter one online), a beach towel, egg shaped sidewalk chalk, gardening utensils, and bubbles. He also needed some sippy cups and socks, so I threw those in there. Daniel was between shifts on Sunday, so we waited to reveal his Easter basket until the following Monday. It was totally worth the wait! Easter basket was a hit! We look forward to many more years of Easters with our boy! We love you Gideon! What tttime do yoy wan te meet? These days I don’t have time. These days I am grateful for dry shampoo. These days my car keys went missing yesterday. These days they are probably in the oven drawer under the loaf pan, or in the tub of 2T clothes I just stored away for next winter. These days I forget to blend in that spot of concealer I applied at the four stop intersection. These days I have mastered the skill of putting my car in park, sliding my seat back, pulling the back of my shoes up over my heels, tying laces if applicable, twisting and stretching my body to reach Gideon’s short little arms, giving/retrieving pacifiers or sippy cups, turning back around, sliding my seat back into position, and taking the car out of park all in the duration of one red light change. These days I have to add “answer ______ ‘s text” to my to-do list or it doesn’t get done. These days I seriously have 5 unheard messages on my phone which – come to think of it – died a few hours ago on the second floor somewhere. There is nothing that has caused me to treasure life and fun more than being Gideon’s mother. There is also nothing that has caused me to re-evaluate and re-organize life’s priorities more than being Gideon’s mother. According to The Wonder Weeks, Gideon is going through Mental Leap 9, which is the world of principles. He is doing his job of figuring out what aspects of the world around him are accessible and prohibited. He is figuring out what his roles are, and what roles Daniel and I have in his life. Gideon is not always happy when he realizes that one of our roles is to stop him from going through with an urge or action because it’s not safe or appropriate. But I can see more and more that Gideon appreciates being understood and heard when he is angry or objecting to something. He is especially really receptive to consistency. Now if Daniel and I could muster up the energy is takes to be consistent. It’s so tempting to be lazy and let him get his way sometimes. While the ways in which Gideon needs us are changing, the things that he has begun to need from Daniel and I require more planning, strategizing, and investing emotional attention. And where he may not need us in certain ways anymore, he has begun to want us more. It’s reassuring that where he needed us to sit close to him to make sure he didn’t fall over, he now wants us to sit close and participate in whatever he’s doing. That being said, in Gideon’s short life I have never been more challenged to maintain balance in my life. Going out with a friend for lunch is no longer simple. I can’t just sit Gideon down with a toy and get a chore done in one sitting anymore. Right about the time I have start preparing dinner is the time of day when my little toddler (!) demands my attention the most. I am immensely grateful for the Ergo, and the ability to carry him on my hip or on my back. Otherwise, we realistically would not be able to eat as healthily and “from scratch” as we do. Don’t cry over spilled cornflakes. I’ve already said more than once that this past winter was rough and very isolating. Well, we are making up for the cabin fever this spring season! I’ve actually had to get a grip on myself and my need for fresh air and human interaction. I’ve overbooked myself once or twice! But thus far, this has been the best spring of my life. Gideon has no small part in that. I’m a broken record, I know, but Gideon gets more and more fun every day! He is just exploding in his development. Between established and emerging skills, there is no down time. He is relentless when it comes to practicing and perfecting his new tricks. Gideon has developed such a big personality, and people around him can’t help but be drawn to his sweet and kind nature. We absolutely love him to death! As for all of our time spent in the great outdoors, here are some select pictures from the last month or two of our little adventures. An afternoon at a park by the Ohio River down the street from our house. If it’s foggy, we can hear the big barges honk inside the house! 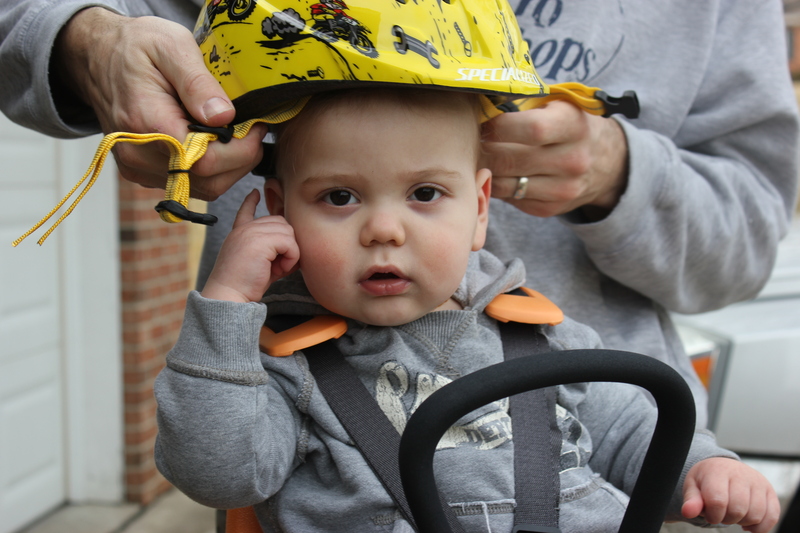 Gideon was not too sure about his helmet at first. But now he associates it with being on the bike, and gets excited when he see’s it. Although we still enjoy our evening walks, we’ve begun opting out of walking to enjoy a nice bike ride. We live in a super hilly area, so it’s quite the workout for me. Daniel and Gideon stay hydrated. Very important. My first off-roading bike trip for the season. Fun and tricky! I kept avoiding tree roots and bumps, which kept my focus on my steering and not so much on enjoying the ride. Daniel kept reminding me that I wasn’t riding a “cutesy bike” anymore. There were also a set of rough steps on the path. I carried my bike down them, but Daniel assures me they will be the first steps I ride down. EEK! My favorite part of riding as a family, is seeing Gideon watch me next to him. I’m so excited he sees me active and enjoying the outdoors! How do you and your family enjoy the great outdoors? I haven’t documented about life in so long, that I was having trouble figuring out where to start. Figuring out where to start catching up on online journaling only delayed the “catch up” entry. Ah! I want to make sure to write about so many things, that I’ll have to catch up in stages and phases. So here’s to getting to the point – short and sweet style. No matter how well I attempted to plan ahead, we kicked off Gideon’s big day with a last minute grocery run as soon as Gideon woke up. We came home and Gideon went down for his morning nap. I rushed around tidying things up and making sure everything was in place. [I don’t know what possessed me but] I decided to leave cooking for last – which I had never done before and will never do again. I set up all the ingredients for the birthday cake and realized that I was 1 egg short. Daniel was a whirlwind of speed as he rushed to the local grocery store around the corner for a dozen eggs. I was frantic. I started to believe that we would not have a birthday cake for his party. In an attempt to use my time wisely, I got to work on making fruit dip and setting up other snack foods for our guests. Daniel’s parents arrived an hour early and helped with last minute food prep, and got Gideon dressed while Daniel and I got ready. No joke, I was putting on the last finishing touches of makeup when the doorbell rang. The day got off to a rough start. It was rushed and stressful. But I was able to relax, breathe, and put all my focus on the toddler of the hour as soon as I saw everyone socializing and munching on the food laid out for them. It helped that Gideon was in a great mood. He took a super long nap before his party, and woke up refreshed and ready to celebrate. We wanted Gideon to have the traditional experience of good party food, birthday cake and candles. We just didn’t want the traditional foods or cake. So we served lots of fruit along with a fruit dip I made out of coconut milk and bananas that everyone loved, a veggie platter, baby carrots and salsa, popcorn, and cubed cheese. For drinks we served Daniel’s famous iced tea, water, and coffee. We had some individual milk boxes for the kids, and they loved it. Everyone ate to their hearts content. Then it was time for the birthday cake! There was not a slice left. Most importantly, Gideon absolutely loved his first slice of cake ever. He knew exactly what to do with it, and it was gone in less then 2 minutes. Daniel and I were so glad to see that he could enjoy a delicious serving of cake that was healthy and delectable at the same time. The rest of the afternoon was spent opening gifts and playing. As is the norm in the family, what began as an hour and a half birthday party ended up being a 5 or 6 hour family hang out session. The immediate family stayed for dinner. Daniel and I decided to make Gideon’s birthday our 6th official cheat day of the year (in addition to Christmas, New Years, our birthdays, and wedding anniversary). We ordered some of our favorite pizza. Ever since we’ve cleaned up our diet, pizza just doesn’t settle well with me. So I enjoy the indulgence, and then wait for the consequences. Guzzling lots of water helps. A great time was had by all, and Gideon was a tired little boy when we went to bed that night. I love Gideon’s facial expression in this picture. So full of anticipation! This is a banner I made for Gideon’s special day. The idea is, I will use it for subsequent birthdays. The best thing in this whole day was seeing how much Gideon enjoyed himself. He loved all the food (I made it a point to make foods that were Gideon’s favorites at the time), and had a blast with his cousins.